Hey there everyone. I'm back! We had a Civic Holiday Monday, and I enjoyed the long weekend. Rudie and I spent some time at my parents' place, and it was great! I'm feeling super relaxed and ready to take on my massive to do list. We spent 4 days in the sunshine. It was so nice to be outside reading a book (I hid my computer for a couple of days). I just wanted to share some LOCAL LOVE. If you didn't know - I really really love my neighbourhood. There are so many amazing businesses and people around me, and it just feels so great to be part of the community. That's the biggest thing I think - especially when living in the city. I feel really lucky that there is such a strong sense of community. If you ever find yourself in Toronto's west-end, come pay us a visit! You won't be disappointed, I promise! 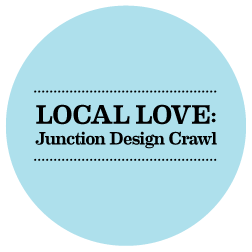 I recently wrapped up a postcard project with some local businesses for the upcoming Junction Design Crawl. On Friday August 23, come on out to The Junction and be guided by the lights! Participating venues on Dundas Street West (on Dundas, between Indian Grove and Clenendan), will have white lights strung up outside so you don't miss a thing. Check out their website for more information about the event.